When husband and wife team, Terresa and Kevin Davis, opened their third restaurant, Orfeo, in downtown Seattle, they aspired to create a Belltown neighborhood gem with a warm, relaxed environment set in the historic Army Building. 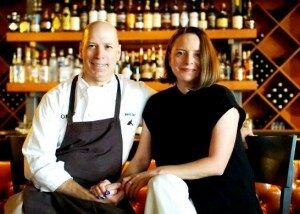 Orfeo features a contemporary Seattle locavore menu that centers around a wood fired oven and a charcoal burning grill. Heavily influenced by the cuisine of France and Italy, Orfeo recreates time honored comfort classics with a modern slant using regional seasonal ingredients and artisan cooking techniques. Davis retained the original wood fired oven but also added a Spanish-style charcoal-fueled oven called a Josper, which is all the rage in Europe. The fuel efficient char broiler imparts a smoky flavor to plump and savory mussels roasted with rosemary, preserved lemon and pepper, then served with a generous amount of grilled bread to soak up the accompanying hearty broth. The traditional wood fired oven has been put to work finishing off the variety of pizzas Orfeo offers on a nightly basis. These pizzas are prepared very differently than other Seattle pizza spots. The style of the dough, which is hand stretched, results in a chewy crust that makes New Yorkers’ hearts sing. The welcoming atmosphere of Orfeo pegs it as a slower-paced neighborhood spot, where all are welcome, casual dress is encouraged and the servers recognize returning guests. Orfeo is well suited for romantic couples, with its low lighting, as well as birthday celebrations for a dozen … or more in the private dining areas. The open kitchen and fractional mural reproduction of Giorgione’s “La Tempesta” punctuate the European vibe. 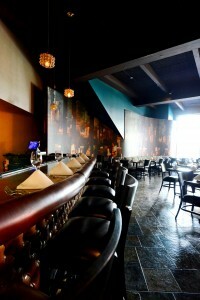 This menu offers something for everyone with small plates, soups, pizzas and handmade pastas. 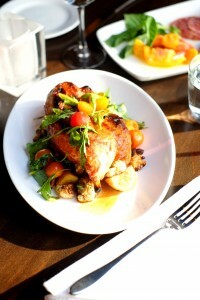 The entrees are very generous and reasonably priced, ranging from pork chops, wild salmon and roast chicken. There’s even a great burger. Above all, Orfeo is a family business and full of personal attention. You can feel that difference when they enter the doorway of 2107 Third Avenue. Stop by and visit with Chef Kevin to taste why Orfeo should be on your “must dine at” list of Seattle hot spots at the Seattle Food and Wine Experience, Sunday, February 21st where he will be serving an Alaskan spot prawn crudo.